Peach trees (Prunus persica) are attractive landscape plants that bear early-spring pink flowers on bare branches. Leaves are long and somewhat droopy, like a willow leaf. Most peach trees do not live long and, depending on your climate, can be a challenge for even the most ambitious gardener. However, if you are determined, and provide the right conditions and care, peach trees are a tasty and eye-catching addition to any garden. Peach trees, along with nectarine and apricot, thrive in the Untied States Department of Agriculture plant hardiness zones 5 thorough 9. Although breeders have developed hardy peach varieties, their growing region is still quite limited compared to apples and cherries. Peach trees require a long growing season and have a strong aversion to cold temperatures. This causes them to suffer in areas where the frost-free season is shorter than five months. Flower buds are also very susceptible to surprise spring frosts. All peach trees require a chilling time in order to produce healthy flowers and fruit. Chilling time is referred to in hours and is reflective of the number of hours below 45 degrees F.
Peach trees are as particular about soil as they are about temperature. 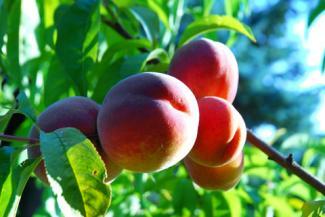 Peaches prefer light garden soil and do not tolerate heavy clay soil well. Dry and somewhat sandy soils are best for fussy peach trees. Peach trees do best in areas with at least eight hours of sun and away from any wild fruit trees or bushes. Planting on a slight hill or slope will encourage good soil drainage. Like all fruit trees, peaches require good airflow in order to thrive but do no like to be placed in areas where they will be subject to extensive winds. Although you can plant peach trees from seeds, it is challenging. It is always best to select healthy cultivars that are suitable for your garden space and growing region. Peach trees tend to grow fast and therefore do not usually require fertilization. If you do fertilize, do so in early spring. Young peach trees should be pruned lightly to remove center branches that limit airflow and light. The best time to prune is right after blooming. Once peach trees are mature, pruning can be done to control height (usually to eight feet or so), remove dead or diseased branches, and to maintain airflow in the center of the tree. A healthy peach tree will be able to ward of pests and disease better than a sickly tree. Regular checking for insects will also help minimize damage and the spread of disease. Peach leaf curl is a fungal disease that causes infected leaves to curl, crinkle, turn yellow and fall off of the tree. To avoid this disease, it is best to choose resistant varieties. Peach split is not a disease, but a physiological disorder that may be due to fluctuating temperatures or freeze and thaw periods while peach pits are forming. It may also occur when the weather has been very dry and suddenly becomes wet prior to harvest. Pits are split, and fruit is sometimes misshapen and are susceptible to rot development. A healthy layer of mulch can help prevent moisture loss as well as watering during dry spells. Be careful not to overwater close to harvest time. Check with your local Cooperative Extension Office for a list of cultivars that are appropriate for your growing region. Below is a list of some popular cultivars used in home gardens. Unless otherwise noted, these varieties will survive in USDA plant hardiness zones 5 through 9. Babcock: This heirloom variety has white flesh freestone fruit and produces early. Four hundred hours of chilling temperatures are required for best results. Early Red Haven: This clingstone fruit tree has yellow flesh and requires 800 hours of chilling time. Indian Blood: Resistant to leaf curl, this peach has attractive white and red streaked flesh and requires 900 chilling hours for best fruit production. Reliance: This peach tree is one of the few that may survive conditions in USDA plant hardiness zone 4. Requiring 1000 chilling hours, this peach is a freestone variety with yellow flesh. June Gold: Popular along the Gulf Coast and in Texas, this large, yellow flesh clingstone variety requires 600 hours of chilling temperatures. It is thought that today's peach cultivars were first grown in southern China, making the peach tree the most "foreign" of all of the fruit trees. The climate in southern China is very similar to that of the southeastern United States where most commercial peach production occurs. Both peaches and their cousins, nectarines, are thought to have followed the silk trade to Persia where they were extensively cultivated. In fact, the word persica means "from Persia". The Romans and the Greeks distributed peaches widely throughout Europe from around 400 BCE. As soon as the Spaniards arrived in Florida, they planted peach trees. By the early 1700's, peach trees were a mainstay of the Virginian landscape and thrived in the southeastern portion of the state. Additional information on the history of the peach tree is available in The Fruit Gardener's Bible. Peaches are best picked when they are fully ripe and should come easily off of the tree limb with a slight twist. 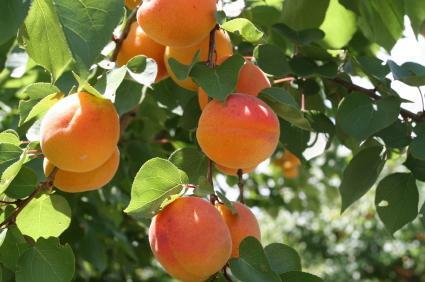 A standard mature peach tree will yield anywhere from 4 to 6 bushels of fruit per season. Store unwahsed peaches for up to five days in a cool location such as a refrigerator. Placing fruit in a plastic bag helps to maintain humidity.